Des-Case oil sight glasses are visual oil analysis products made of strong acrylic or polyamide to withstand factory floor conditions. They offer an array of versatile features including oil level markers, port configurations for attaching sample valves, and magnetic drain ports for removing water and capturing ferrous residue for analysis. Please contact us for pricing and availability. Our friendly staff is standing by to assist you. The Oil Sight Glass Level Monitor (OSGL) allows you to view oil color and clarity while monitoring the level of the oil in the reservoir. Choose a length from 3″ to 24″ corresponding to the distance from your equipment’s oil reservoir access port to the maximum height the oil will reach. View water accumulation and drain it off with the drain valve. An optional magnetic drain valve also captures ferrous particles for analysis. A dual port version is available with a second 3/8″ NPT port to allow installation of a sampling tube. The Des-Case Oil Sight Glass (OSG) includes an innovative white bottom to dramatically increase the visibility of oil contaminants that harm equipment. The drain port configuration allows it to drain water properly whether the sight glass is in a vertical or horizontal orientation. 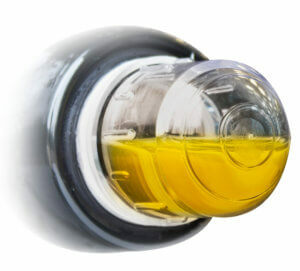 With the indication marks on the side of the bottle, you can quickly and easily monitor the rate of water accumulation. The OSG is available in multiple size and connection options, and an optional magnetic drain valve captures ferrous particles for analysis. The Des-Case Oil Level Indicator (OLI) provides a visual gauge for the oil level inside large tanks, gearboxes, and reservoirs. The OLI is a clear acrylic tube with 1/2″ NPT threads at each end. Red and green level marker stickers are included for marking upper and lower limits. The top breather and bottom fitting shown are sold separately. The OLI is available in multiple lengths, and custom lengths are available on request. The Des-Case 3-D BullsEye, made of a high-performance transparent polyamide, allows immediate and accurate visual oil level monitoring from virtually any angle. Engineered to outperform and outlast traditional viewports, the inherently strong material provides excellent impact, chemical, and UV resistance. Available in sizes from 0.875″ to 2.32″ and in NPT, Metric, and BSPP Threads. Contact Filter Products Company for excellent Des-Case filtration products.